Four CTV News affiliates rolled out new studios this month, as part of a transition to HD production. CTV Atlantic, Ottawa, Regina and Saskatoon debuted new or updated sets that feature large monitor walls, backlit panels and roomy anchor desks. 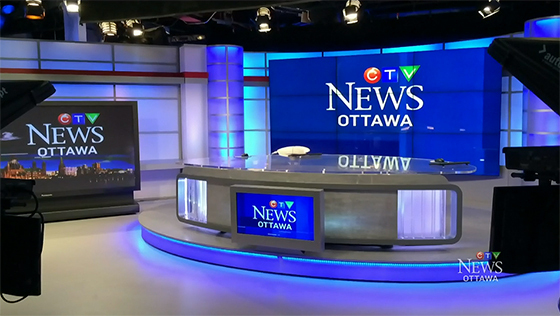 CTV Ottawa’s set includes a 3×3 monitor array, the CTV trademark desk (used by CTV at the Vancouver and London Olympics), an interview area and a large multipurpose area. 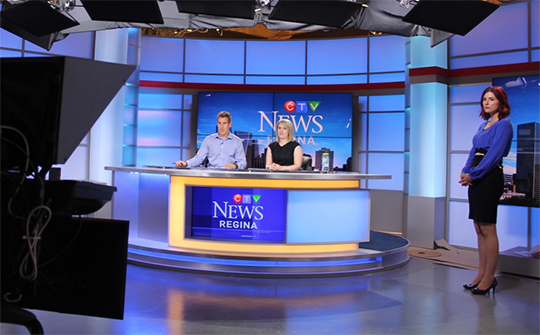 CTV Regina’s set includes a 2×2 monitor array, multiple standup locations and a large curved couch. 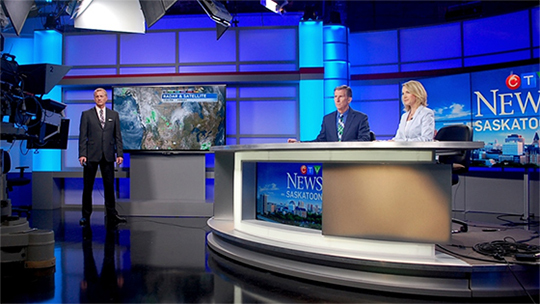 CTV Saskatoon’s set includes a 3×2 monitor array, a large monitor to the left of the anchor desk and various standup locations. Overall, it looks like Ottawa received the best HD upgrade. All of the sets mix-and-match pieces and paneling, likely from Gelbach Designs. CTV Regina previously used Gelbach for another set design. The backlit panels with their clean lines and bright blue coloring look nice on air, a definite change from the previous CTV sets. But, the over use of blue and grey make the sets very cold in tone. We’ll see what the viewers think, now that they can view the news in HD.